Overview of the CMS/ONC recently released meaningful use stage 2 final rule requirements for the Electronic Health Records incentive programs. In the fact sheet, CMS states that the stage 2 final rule will give healthcare providers more time to meet the Stage 2 criteria with a provider who has attested for Stage 1 in 2011 would attest to Stage 2 in 2014. This is great news as providers are NOT required to meet Stage 2 meaningful use before 2014. 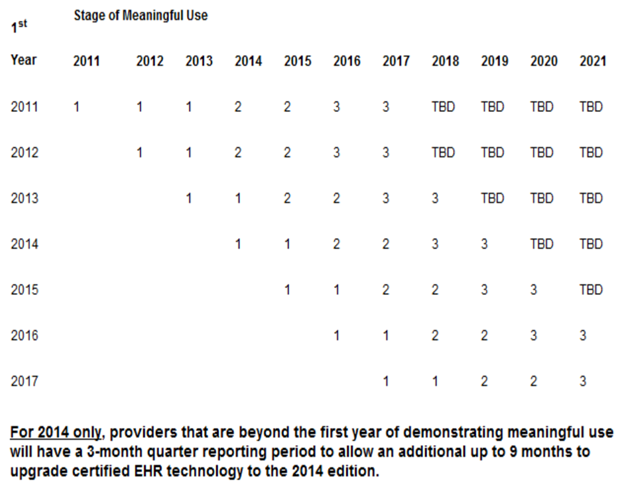 CMS has provided the following table shown below that illustrates the progression of meaningful use stages from the first year a Medicare provider begins in the program. The final rule adds “outpatient lab reporting” to the menu for hospitals and “recording clinical notes” as a menu objective for both EPs and hospitals. There will be 20 measures for EPs (17 core and 3 of 6 menu) and 19 measures for eligible hospitals and CAHs (16 core and 3 of 6 menu). Final rule reduces some thresholds for achieving certain measures and modifies criteria for exclusions to respond to difficulties commenters identified in implementing certain objectives in certain situations. Patient Engagement – Two new core objectives (providing patients online access to health information; secure messaging between patient and provider) with measures that require patients to take specific actions in order for a provider to achieve meaningful use and receive an EHR incentive payment. Electronic Exchange of Summary of Care Documents – In the final rule CMS is reducing the first measure to a lower threshold of 50 percent. The second measure required that a provider electronically transmit a summary of care for more than 10 percent of transitions of care and referrals, and that the summary of care be electronically sent to a provider with no organizational or vendor affiliation. Outpatient Lab Reporting for Hospitals – Rule includes lab reporting as a menu objective that gives hospitals the flexibility to select other objectives for meeting MU and receiving the incentive payment. Hospital-based EP Definition – CMS has modified the regulations on “hospital based” so that EPs who can demonstrate that they fund the acquisitions, implementation, and maintenance of CEHRT, including supporting hardware and interfaces needed for meaningful use without reimbursement from an eligible hospital or CAH —and use such CEHRT at a hospital, in lieu of using the hospital’s CEHRT—can be determined non-hospital based and receive an incentive payment. Beginning in 2014, all Medicare providers that are beyond the first year of demonstrating meaningful use must electronically report their CQM data to CMS. 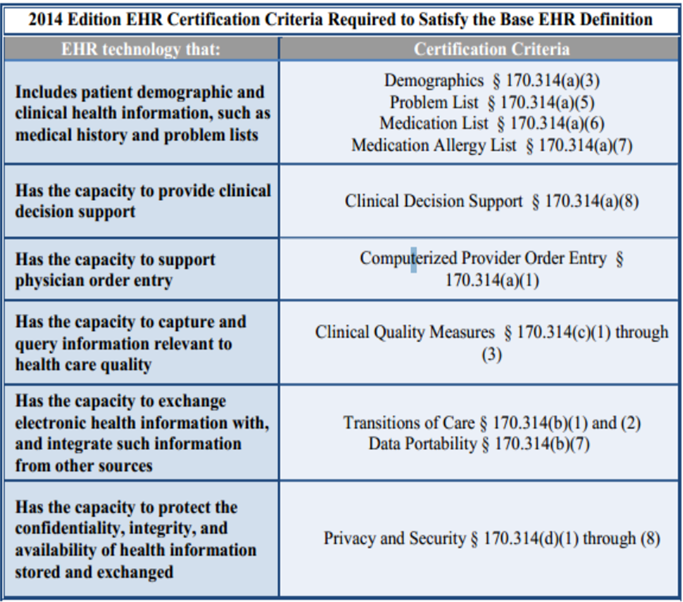 A fact sheet on ONC’s standards and certification criteria final rule is available at http://www.healthit.gov/policy-researchers-implementers/meaningful-use-stage-2-0. So what do you think about Meaningful Use 2.